January 2018 Update: Some of these apps are no longer around but the principles are the same. For my current app recommendations, check out my Life Stack. Dreaming up resolutions is easy. Dreaming up actionable, measurable resolutions is harder. Actually doing them is the hardest part. I’m prone to procrastinating on major projects and rushing to finish them at the last minute if I don’t have regular ways to track my progress. I’ve been finding success by creating an arsenal of robot overlords to keep myself accountable to my resolutions not just once a year, but every single day. There’s three things I try to create into any resolution or goal: automation, peer accountability, and trackable metrics. This is a version of SMART goals (Specific, Measurable, Accountable, Relevant, Time-bound) but I use sneakier ways to keep myself on track. The most important element of the goals I work on are its ability to be tracked by robots. “Do 30 minutes of German practice a week” is a better goal than “get better at German” because it’s specific and measurable. But “level up 3000 points of German by next December in Duolingo” is a a robot-trackable, peer-accountable goal. At any point, I can see where I’m at on my progress towards 3000 more points. If I’m behind, it helps motivate me to get back on track. 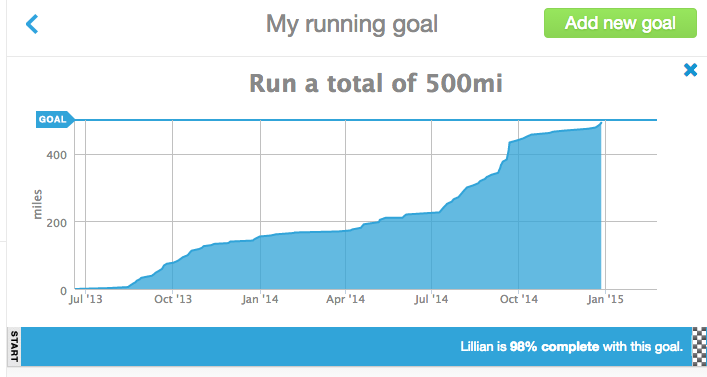 If I’m doing well, looking at the graph helps motivate me to keep going. People keep asking for me for my recommendations on goal tracking tools, so here’s a collection of my favorite Robot Overlords, sorted by goal type. While there’s a bunch of different types of goals for which specific robots are helpful, nothing is better at overall goal management than Beeminder. It’s a combination of quantified self and behavioral economics. Essentially, you tell it what you want to do, and if you don’t work towards those goals in a systematic way, it’ll charge you money. It’s helpful in that you don’t have to worry about whether or not you’re making progress on a goal, because Beeminder will tell you if you’re off track. @bmndr It was @aaronpk saying “beeminder is not for the faint of heart” that pretty much convinced me. My brain heard that as a challenge. After half a year of using Beeminder, I’ve moved from one goal to eleven goals. I use Beeminder to keep on track with practicing German, keeping on top of my emails, sleeping an average of 7 hours a night, cleaning up around the house, packing lunches for work, walking enough, uploading pictures to Flickr, blogging, and even making sure I keep a handwritten journal. Most of my goals require no manual data entry on my part, meaning robots do all the work behind the scenes to make sure I’m up to date on my goals. While the fact that I’ll have to pay out money if I don’t complete my goals is motivating, I’ve only paid out on a goal once. That’s because getting reminded by Beeminder that I need to go to sleep by 10PM or answer 20 emails or upload a picture or clean the kitchen is enough to make me jump on doing it. If you never go off track, you’ll never pay a cent, which is the reason I love beeminder. It’s just the THREAT of owing money that’s enough to make me get to work. One of the advantages of Beeminder over competitors like StickK is that it tracks your progress over time and you can adjust the hardness of the goal as you go. StickK and similar sites have you bet money for an end goal (like losing weight by a certain date or finishing a draft of a book on time) but I’d rather bet on small, incremental progress and be coached by a robot daily rather than have a big payoff and/or letdown if I don’t get something done by X date. The best goals aren’t goals, but daily changes in lifestyle. My Beeminder goals are pretty traditional, but people Beemind out of the box – things like time spent knitting, with their kids, or time spent on prayer/rituals. Anything quantifiable can be beeminded. The other thing I like about Beeminder is the peer accountability of the goal. I’m able to post my graphs publicly, so anyone can see things like my progress on email management live at any time (there’s also a private feature for goals you want to hide). For health goals, my magic solution is using the robots in my pocket and on my wrist to track data without having to do a thing and then linking that data to tools that warn me if I’m off track. My Jawbone Up automagically tracks my daily steps and my sleep, which I then link to Beeminder. This means I get a combination of automatic data and the bite of Beeminder. At the moment, I get charged $5 by Beeminder if I don’t average 10,000 steps a day and average 7 hours of sleep a night (this is an average, so I can make up the time over the week – 9 hours one night, 6 the next is okay in the end.) If I get really behind, I can actually say “I have to go to bed by 8:30 or walk to the coffeeshop otherwise I get charged $5”. This helps with making sure I’m on top of my sleep hygiene and daily steps. And I don’t need to do anything special because they’re integrated automatically! 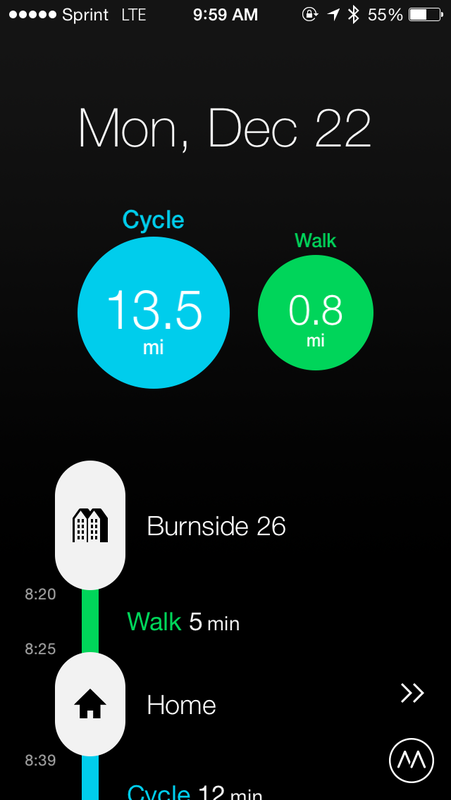 I use the Moves App on my phone to track all of my biking, walking, and running. This is a really fabulous app that not only has a great algorithm to figure out what mode of transportation you’re using, but keeps GPS tracks of where you’ve been that are really nice and easy to read as a timeline of your day. For some, this is too invasive (though the data is stored locally), but I love me some data and I really love me data that involves no manual work on my part, so I love Moves. It works on Android and iPhone. (Also, sometimes it’s helpful for remembering when I got to work when filling in my timesheets 2 weeks later). I find the battery drain to be minimal. Moves automatically sends all my runs, walks, and bike rides to Runkeeper. Sounds labyrinthian, but it takes less than 10 minutes to set up and then it’s done forever. The other cool part about this is that it’s really easy to see how much I’ve walked, biked, and run for the whole year, which is neat in aggregate. Runkeeper then sends all that data automatically to Gym Pact, an app that charges me money if I don’t meet my fitness goals for the week, and pays me a small amount of money if I do. Gym Pact is different than Beeminder because while Beeminder is simply a stick, Gym Pact is a stick AND a carrot. I set the amount of times a week I plan to work out, and Gym Pact uses data from Runkeeper to determine if I’ve worked out enough. It only counts one workout per day, and the time spent exercising must be greater than 30 minutes. At the end of the week, if I haven’t met my goal, I get charged $5 for each day I missed. If I meet my goal, I get paid out a sum of money from the other people who didn’t meet their goal. Usually it’s around $1.25-$1.50 a week. I’ve been using Gym Pact for a year and it’s netted me about $45 – I’ve only paid out $5 for failing to meet my goal once, so it’s paid off. It’s not a lot of money, but it’s enough to splurge on fancy coffee occasionally and I’ve definitely gone on runs at 7PM on Sunday night so I don’t get charged $5 for missing my Gym Pact goal. And while it isn’t a robot, one of the best tools for working out for me has been getting a running buddy. All summer, at 6:30AM every Tuesday and Thursday, I knew that my friend Aaron was going to expect me to go running 3 miles with him and I’d have to cancel on him if I was feeling lazy, which generally meant pride & accountability resulted in getting outta bed even when I didn’t realllly want to. As a reward for running on rainy days, we are allowed to get fancy coffee, which helps as extra motivation on those grey days. $70 every two weeks goes into an “emergency savings/stupid mistakes” account. This is money that can be used for anything that’s deemed an “emergency”. I rarely have to pull out of this account, but it’s there so I don’t go broke from an unexpected expense and start pulling from my goal savings account. In the past year I’ve dove into this account when: a freelance check was months delayed and my cash flow was down (I replaced the money once the check came through), I unexpectedly owed more in taxes, I spilled coffee on my phone and had to pay to fix it, I lost an expensive SD card, and when I had to pay a large change fee on a flight due to stupidly booking it on the wrong month. This is also the savings account that my checking account overdraft protection is linked to, which is failsafe of making sure I don’t get overdrawn accidentally. $100 every month goes into an IDA account, which is a savings program for low-income Oregonians to save for qualified goals. The IDA account I have is savings for a down payment on a house, which is a long-term goal for me. When I do take the cash out, I will get a 3:1 match, meaning that if I save $2,000, I will get $6,000 of free grant money. I have no access to withdrawals until I buy a house, however, making this the perfect commitment vehicle as I can’t pull it out on a whim. $60 every week goes into a savings account called “Big Goal”. This is where the bulk of my savings ends up. This is based off being able to take a sabbatical in 2-3 years or will be used towards buying a house. While the Big Goal isn’t currently defined, the main advantage is that it *isn’t* my general savings account that I use for emergencies, that way my long-term goals aren’t raided when I do something stupid. $50/month goes into my IRA retirement account. 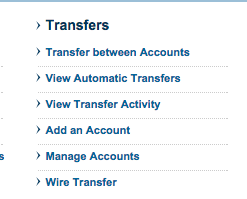 This number hasn’t changed since the day turned 21 when I opened the account. Slow and steady with compound interest wins the race? Mostly, my robots work quietly in the background and I don’t even notice that they’re pulling out my money. But when I need to check in on goals and spending, I use Learnvest (it’s similar to Mint but I prefer the interface) and my bank’s own goal-tracking mechanism. Though I don’t hold credit card debt, I use Ready for Zero anyway to track all my rewards credit cards in one place and make sure I pay off 100% of my balance in full every month. They send you adorable little animated gifs everytime you pay off your credit card bills, which makes paying bills a little more fun. Once again, I use a Beeminder to bug me to upload photos to Flickr and blog posts to my website, which means I’m regularly producing work and releasing it. (And I use a script that autouploads so my sneaky robots tell Beeminder how I’m doing without me having to type anything in.) I’ve had friends use Beeminder to help them finish writing books. Anything quantifiable can be used with Beeminder so you can do amount of time spent writing, number of words finished, or number of photos uploaded. This can even work with making sure you’re working on your zine! That evil, evil beast. Can’t live with it, can’t work without it. I use email as my primary to-do list, and because I have multiple jobs, I have to manage multiple inboxes. I made a nice little script that updates Beeminder every hour about how many messages are in my inbox and if I get too far off track, it’ll charge me money. This means I’m often answering huge amounts of email at 9PM before my 10PM Beeminder deadline. Based on the recommendation of Willow, I now also use Boomerang, a simple Chrome extension that lets me schedule emails to be sent or “boomerang” them back to my inbox at a later time. This is useful to check-up on the progress of tasks. It makes me seem really on top of things when I email and ask “Where is this at? Do you need more information?” and information I might need for a meeting or event pops up right before the meeting. Danny has made a cool gmail extension called “snooze” that does the same thing, and this is also now a feature of the beta Google Inbox. I recommend this for email management, combined with Beeminder. I don’t currently have any code projects I’m regularly coding on, but I’ve used Beeminder in the past to keep me working on Code School and making commits to code on Github. For learning languages, I can’t recommend Duolingo enough. It makes language learning fun, carves things up into bite-sized chunks, and if you like, you can become obsessed with your streak number like I am (the 290 on the image below is the number of days in a row I’ve completed a lesson). While Duolingo alone can’t serve as the only thing you can use to become fluent in a language, it’s really good at making sure your language skills don’t go rusty and can be useful to start a new language. If you like to take your gamification with a bit of extra motivation, you can match up Beeminder with Duolingo, and get a financial “sting” if you get off track on your goals. Oh man, that was a long post. Well, that was a long list of the robots that are in charge of my life, and partially just a loveletter to Beeminder. But I hope it was helpful and please let me know if you have any questions about robots, goals, or other types of accountability. This post is the second in a series of 4 end-of-year posts. You can view the other posts about goals and resolutions here. Previous Previous post: Oh Etsy? Next Next post: Who to give to? This is grand. I think I shall integrate some of these robots into my own life. I just signed up for Beeminder. One simple, achievable goal right now, others to be added. I’m waiting on a new phone (my first! ), and will be adding apps to help keep me on task. Thanks for the inspiration, my dear!